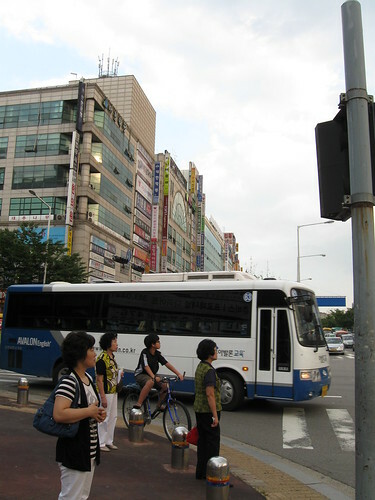 The Streets of Korea – Hello Korea ! If I can even say, “our.” As in our people, uri nara. That’s the thing about being an adoptee – we have to earn that right, even though it should be as plain as the nose on my face. 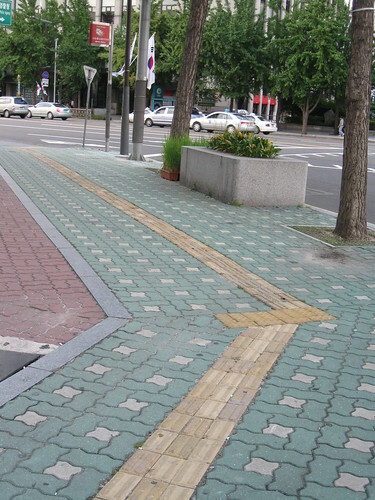 This is a typical paving pattern you’ll see. Concrete, stamped concrete, or marble is very rare. It is mostly these various masonry units and, at the more traditional or post modern traditional sites there will be the most ankle-breaking square cobblestones you ever saw. Notice the yellow ribbed stripe down the center of the sidewalk? This is a wayfinding path for the blind. And also notice how the direction change gets a different paving pattern. Maybe I’m wrong, but there seems to be more blind people in Korea…but the ones that are here have been accommodated very well. These stripes exist on almost all public walkways, and continue down into the subways. where all the handrails have braile at the beginning and ends, and every first and last step has another change in paving pattern. 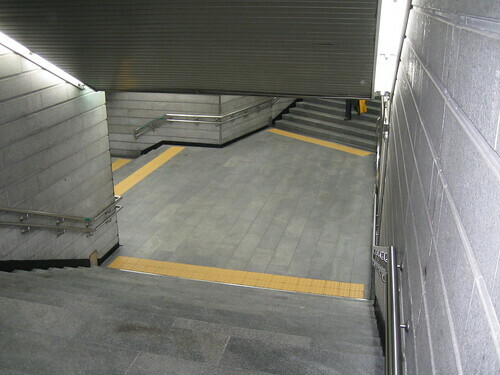 These wayfinding trails extend to the subway train cars (as mentioned in a previous post) and in this way, the blind can find the most expedient route to the train and exit directly to the stairs at their destination stop. Other people in need often make a round of a train car, passing out literature describing their situation, usually selling gum at a mark-up, and then quickly make a second round to gather their literature back up. 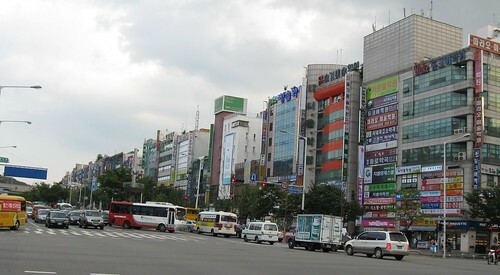 This is one side of Hagwon-ga near my school. Notice the bus blocking this photograph. If you could see past the bus, you would see the entire street lined with similar buses (about fifty of them at the time of this photo) dropping kids off from picking the kids up from their various daytime schools to begin yet another round of classes at the private academies, or Hagwons. There are so many on this boulevard that they named the street academy street. Here is the other side of the street…ALL of those buildings are filled with hagwons. 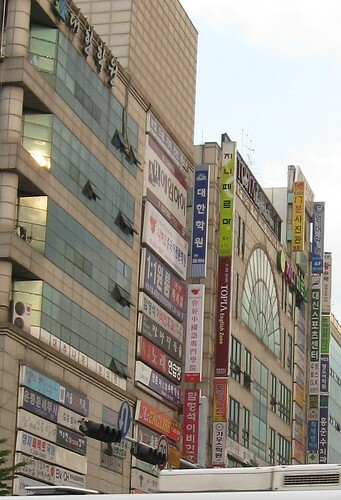 About 6 floors each, with a retail business on the street level. Building after building after building after building…all filled with cram schools. The majority are for English and math, but there are also some art and music ones, and specialty ones. This is the main drag, but there are still streets to the right and streets to the left also filled with less prominent hogwans, and sprinkled throughout this city in every neighborhood are even more. 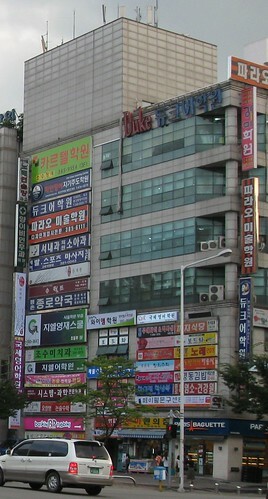 See all those signs? The majority of them are showing what schools are operating within. I wish I could make a living here in any other way than contributing to this madness. ← what’s to become of me? 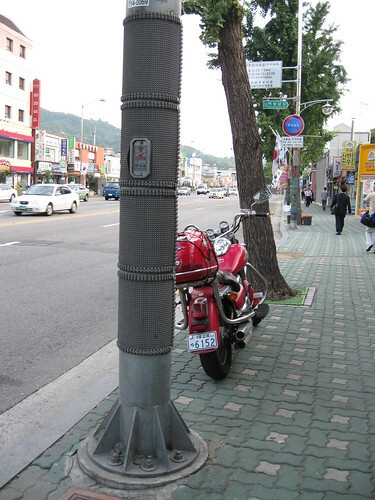 Actually, I thought the light posts were covered so that people can’t plaster them with flyers. It reduces the crap that people post on streets. really? seems like overkill. 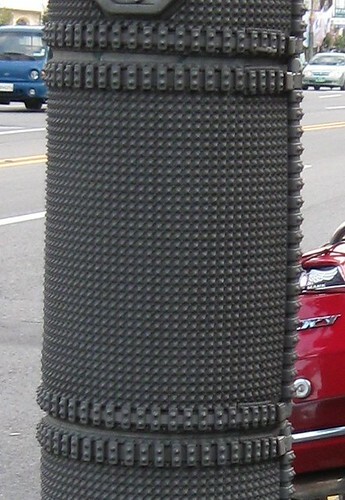 I mean, that is serious armour on those poles!